James Harden is the most valuable player in the NBA. 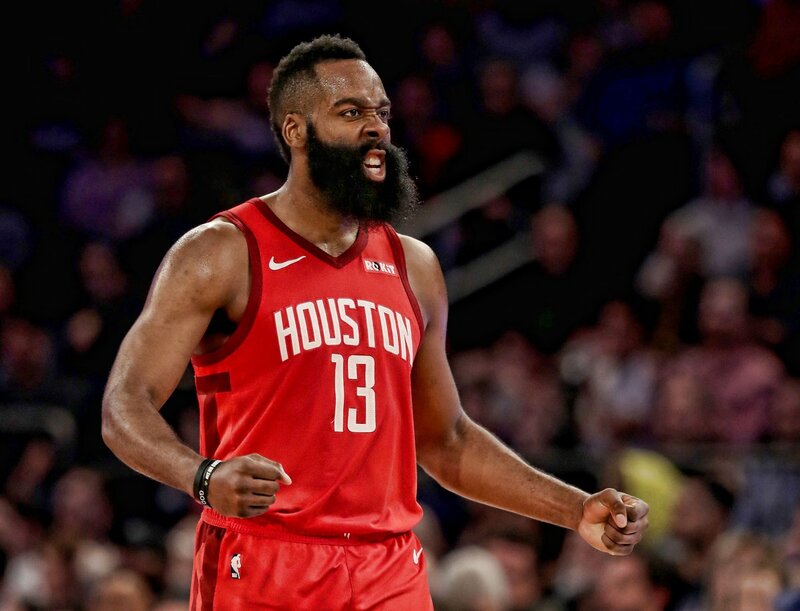 In a January meeting with the frankly execrable New York Knicks, the Houston Rockets needed him to score 61 points to eke out a win. Whether this is a referendum on how hurt the Rockets are (it is), their lack of supporting talent (it is), or just a terrible run of bad luck (it's this, too), it's indisputable that James Harden is the most necessary player in the league right now, and he certainly looks like the best as well. Since he declared his intention to retain the MVP award this season, he's stepped up to every opportunity fate has cruelly obliged him with, and every bit of his excellence is absolutely necessary. Fifteen rebounds. Four assists. Five steals. Thirty-eight shots. These are bizarre, outlandish numbers that scarcely make sense next to one another. He's done all of this, for three games, with no assists on any of his made shots. James Harden is some otherworldly beast who deserves neither the mistrust he gets around the league nor the sheer underperformance of his teammates. Last year's Rockets were a team worthy of his contributions. This season, his value is even greater and his teammates are somehow even lesser. Every single iota of his historic run has been necessary. They've needed forty minutes of James Harden every night just to win every other game in the month of January. He's doing more than anyone could be asked to do and he still needs to do more. This is the league MVP, and this season is both a revelation and a tragic waste. In short, James Harden is the Kobe Bryant that league fans seem to think Kobe was, and it's fitting that he tied Kobe's record tonight for the most points ever scored by an opponent at Madison Square Garden. He's an entire offense on his own, and with the current state of the Rockets, he must be. He's in the running for greatest and most complete offensive player of all time, and Wilt Chamberlain once averaged 50 points for a season. The best and worst thing about it is that none of this is hyperbole, even as the Rockets struggle to stay six or seven games above .500 and sit in the middle of the playoff pack in the Western Conference. If the Rockets could figure out how to approximate last year's team, even a crude approximation, Houston's ceiling would be sky-high. But with Chris Paul and Clint Capela out, with Paul's long-term status unclear, with new and untested players taking on high minutes loads, it's unclear if that's now possible. It's unclear if it ever was. If everyone except Eric Gordon and James Harden have forgotten how to shoot three pointers (3-19, 16%), that may be a forgone conclusion. Of course teams simply double Harden and don't worry about the rest of the perimeter. Of course James never has an open look or an open lane. He manages to score forty, fifty, sixty points a night anyway. Outside of James Harden, this is as close to a worst-case scenario for Houston as I've ever seen. Nevertheless, they've kept their heads above water primarily on his unprecedented offensive ability. Hopefully the greatness of James Harden will not be wasted on those who don't care to see or acknowledge it. Hopefully, the greatness of James Harden will not be wasted by a team that can't stay healthy, can't shoot and can't stay anywhere near their career numbers. Hopefully this excellence won't keep being necessary.